on press freedom makes for frightening reading. More than ever, the group says governments around globe are silencing journalists, censoring their articles, or worse, jailing or even assassinating them. Google has worked with Reporters Without Borders for several years now, supporting their activities in favour of keeping the Internet free and open. 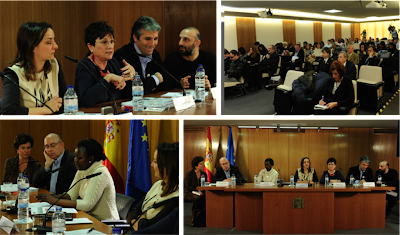 So it was natural that we would appear in Madrid at the Spanish presentation of their new report. While most attention these days in Spain focuses on the country’s economic crisis, the Reporters Without Borders event demonstrated a strong attachment to freedom. Some 100 reporters attended and coverage emphasized how 2012 saw a major crackdown on the press around the globe. Panelists included Epiphanie Ndekerumukobwahe, the widow of an assassinated Rwandan journalist, and Nedim Senar, a Turkish journalist who was jailed for his exposés on the army’s plot to overthrow the government. We were the only private company in attendance and spoke about how the open and free Internet has come under attack. Google’s products - from search and Blogger to YouTube and Docs - have been blocked in more than 30 of the 150 countries where we offer our services. At least 17 countries have cut off YouTube at one time or another and it remains off limits today in China, Iran, and more recently, Pakistan. And, of course, there is our experience in 2010 in China ­­ where a steady and measurable increase in censorship in every medium, including the Internet, ultimately led to our decision to stop providing a local search engine. Our work with Reporters Without Borders continues in the coming weeks with the hosting of the “Netizen of the Year” award ceremony in Paris. We look forward to updating you on this exciting activity shortly. Reporters Without Borders latest report on press freedom makes for frightening reading. More than ever, the group says governments around globe are silencing journalists, censoring their articles, or worse, jailing or even assassinating them.